In the summer of 2015, a Facebook engineer was combing through the company’s internal data when he noticed something unusual. He was searching to determine which websites received the most referral traffic from its billion-plus users. The top 25 included the usual suspects — YouTube and the Huffington Post, along with a few obscure hyperpartisan sites he didn’t recognize. With names like Conservative Tribune and Western Journalism, these publications seemed to be little more than aggregation content mills blaring divisive political headlines, yet they consistently ranked among the most widely read websites on Facebook. I first noticed this in the middle of 2016, as soon as I started looking for data to supplement my intuitions. I just went back to some historical data and did a similar analysis. The other important thing to note is that I don’t work for Facebook and I was able to do this analysis. Why does this matter? Because it means it’s not just Facebook that failed to call attention toward this. We failed. But who is we? What are the organizations that could have and should have warned us of this? Did they try and did no one listen? Do they even exist yet? Unlike a Facebook employee, I can’t see how many people clicked on a link, or how many people saw a post in their newsfeed. I have less ability to tell how likely it is that someone is a bot, or how many times a link was promoted. But I can see how many times people liked, shared, reacted, and commented on a link—and that was enough to know that something important was happening—and to guess at the eventual societal ramifications. 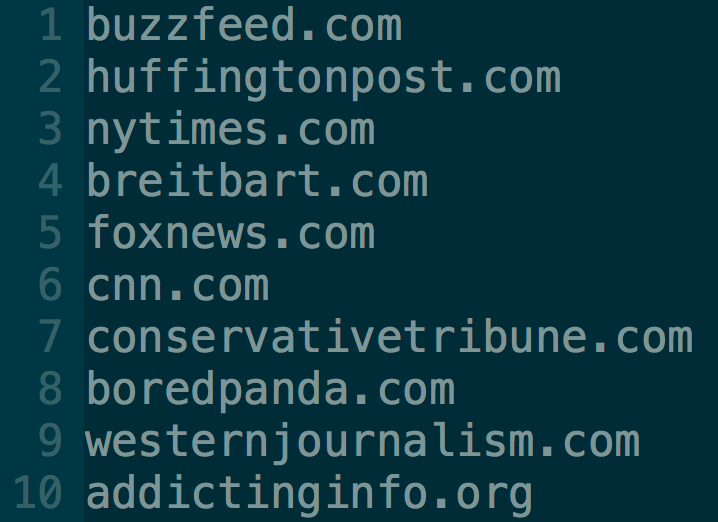 Troubled by the trend, the engineer posted a list of these sites and associated URLs to one of Facebook’s internal employee forums. The discussion was brief — and uneventful. “There was this general sense of, ‘Yeah, this is pretty crazy, but what do you want us to do about it?’” the engineer explained. I don’t want to live in a world where hyperpartisan or even false content is censored. But I do want to live in a world where it is more profitable to write articles based off facts than fiction. I want to live in a world where people are rewarded more for being kind than for being mean, malicious, or deceptive. I believe that world is one where people are better off — a world with less war and violence. The way we design our systems for sharing knowledge determine which world we will live in. Methodology: I started with the top 5000 engaged links each day (engagement is the sum of likes, shares, reactions, and comments). I then aggregated engagement by hostname, and sorted the result. Finally, I manually removed sites from the list until I had list of only US based non-platform sites containing political and/or social justice content (so I removed e.g. YouTube.com, bbc.co.uk, and espn.com; boredpanda was an edge case). This entire process took around 40 minutes, as I’d already done significant engineering and data collection to enable this sort of analysis. Note that I did not look into the accuracy of stories for these sites, but just did a quick scan of the tone and content, and it looked as if both conservativetribune.com and westernjournalism.com could be classified as hyperpartisan. If someone is interested in doing a more nuanced analysis like this, here is a csv of the links and interactions for those two sites during that time. Aviv is continuing this work as a Knight News Innovation Fellow at the Tow Center for Digital Journalism at Columbia and as Chief Technologist of the new Center for Social Media Responsibility at the University of Michigan. To stay in the loop for related research, follow him at @metaviv and sign up for email updates at list.aviv.me.